Mark Boslough’s super computer generated, comet airburst simulation is a must see. In it we see the exploding comet detonating high in the atmosphere, and becoming a supersonic down draft of thermal impact plasma hotter than the surface of the sun. But watch the sequence closely. And pay particular attention to the post impact updraft at the center of the flow. And to the directions of flow of the airburst vortex at the surface, as the impact plume develops at the center of the vortex. You might want to replay it a few times. The old way of imagining one of those events was to think of it as a point explosion high in the atmosphere. And it’s still popular in the press to pretend the atmosphere dissipates the blast. As you can see, it doesn’t. Using super computers has allowed them to retain the downward momentum. So we can see the impact vortex hit the ground as a supersonic blast hotter than the surface of the sun. It would be naive to a fault to think such energies can be dissipated without significant planetary scarring, or ablative geomorphology. And, in fact, in north central Mexico, the recent marks of thermal airburst down blasts are terribly common. Forensically speaking there are thousands of square miles of pristine blast effected materials in central Mexico that describe the fall of a super cluster of too many air bursting fragments like the one Dr Boslough’s simulation shows, and even larger, to count. I’ve chosen an ordinary-typical example of a geo-ablative airburst scar. Note the radial, outwards flowing curtain of melt. The wind-driven patterns of flow are a perfect match for the bottom of the large airburst vortex in Dr Boslough’s simulation. The white line in the image is 5 miles long. 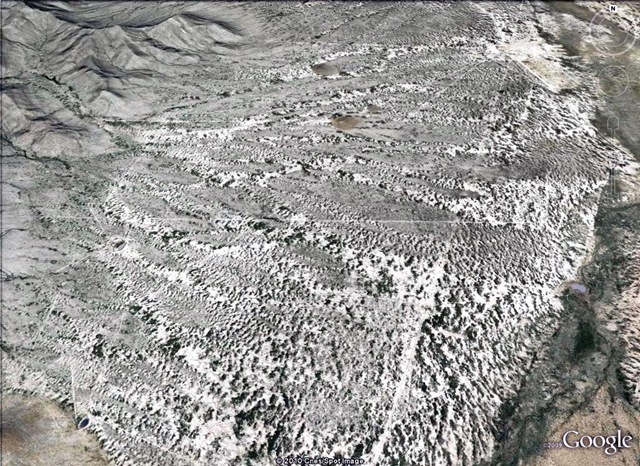 The mountain, and others like it, are the central uplift of an airburst impact structure that is different from anything ever described before. As you can see, the radial, outwards flowing ejecta curtain is almost perfectly pristine, exposed on the surface. There is no question but that the mountain is the source location of the materials in the ejecta curtain. But the mountain is a Questa that consists of uplifted meta sedimentary strata. It’s not a volcanic vent, or rift. The picture begins to make since when we realize that the mountain, and its pristine ejecta curtain is is only a few thousand years old. This ejecta curtain of geo-ablative melt was blown outwards by the impact down-blast. These are the patterns of movement you see when a fluid is driven across a surface by high velocity atmospheric pressure like the froth on a stormy beach. The indication of the speed of the materials in the emplacement of the ejecta curtain is the outwards pointing chevrons. The shocker here, is that the mountain probably didn’tt exist in any form at all at the moment of impact. To really understand the process that formed the uplift, we need to look closely at the ablative patterns in its outer surface. In the simulation, note the supersonic upwards flow in the center of post impact vortices. The mountain was born almost in an instant as the surface bounced back from pressure of the shockwave, and rebounded up into the impact vortex. So, at the same time the material in the radial ejecta curtain was being ablated, and blown outwards, the rebounding surface at the center was ablated, and the materials that were removed, were drawn up into the impact plume by the upwards flow at the center of the vortex. And the signature of that ablative upwards flow is in the deep V shaped excavations that wider at the top, and center of the flow. 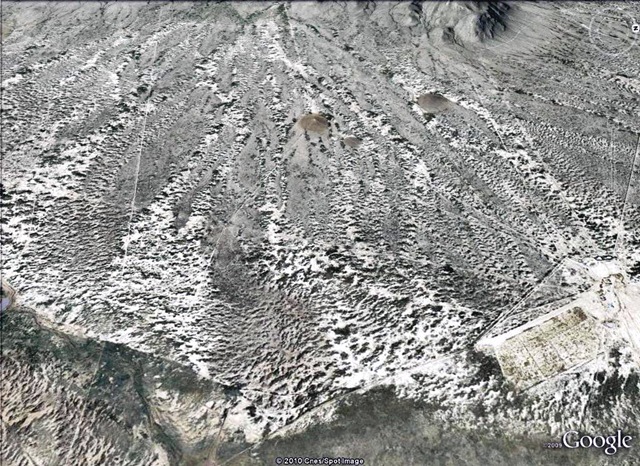 There are well over 50,000 square miles of geo-ablative terrains like this in central Mexico alone. And the region is unique on the surface of the Earth. The Arid climate has preserved the blast effected materials in context, and in perfect condition. Most of it is in almost the same condition as it was the first year after the impact storm. 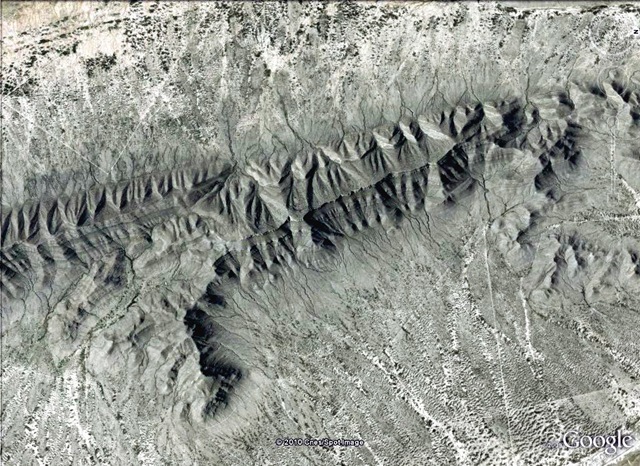 These kind of strange, and surreal geo-ablative terrains can also be found in other parts of the world. But everywhere else on Earth the geo-ablative melt has decomposed to become soils. Or the materials have eroded so much the patterns of movement, and flow, in the emplacement event are no longer legible. So the melt has become indistinguishable from ordinary volcanic tuff. The ability to read the fluid emplacement motions of all of the blast effected materials of such an event with such confidence, and in such detail, makes it a kind of written language, or choreographic dance chart. The blast effected materials of the Mexican impact zone can be thought of as a kind of cipher key, or ‘Rosetta Stone’, for learning to read the empirically true, geo-history of the world from the rocks themselves. I should clarify that. I don’t think the updraft of the impact vortex vacuumed the center up, only any ablated materials. I think it was uplifted as a rebound from the initial impact shock of the blast wave. Which would have delivered significant pressure. The upwards flow at the center of the vortex only ablated, and sculpted, the deep V shaped excavations that get wider at the top, and center of the flow. Also, there is no magma chamber there. And no vent. After two years, I still can’t find a shred of seismic, tomographic, or any other data, that indicates a vent, or confirms a magma chamber there. If you want to understand an explosive event you study the motions of the blast effected materials. The truth can be read in the clearly legible emplacement motions of the perfectly pristine, radial apron around it. 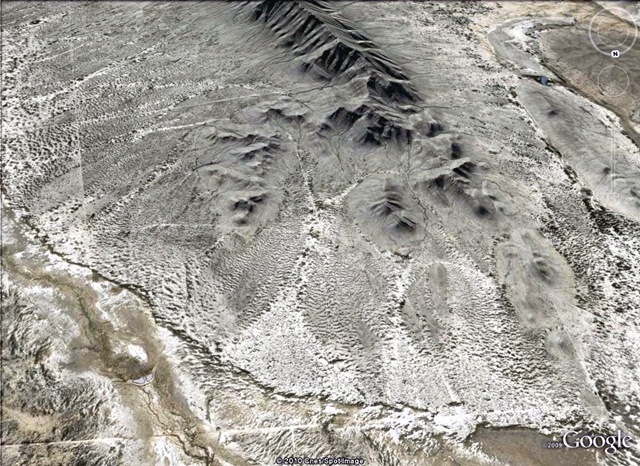 But if it is volcanogenic, and was laid down before the mountain underwent millions of years of erosion, the mystery becomes: How did it remain undisturbed on the surface, and in pristine condition, while the alluvium that was eroded from the mountain was removed over the top of it without a trace? That it was emplaced at hundreds of miles per hour, in a high velocity radial outward flowing, pyroclastic density current there is no doubt. So it goes to fluid mechanics. And the critical question becomes: What was the motive force? Look closely, the emplacement motions can be read like a dance chart. The motive force during the emplacement of those materials wasn’t gravity pulling a collapsing ash column down slope. It was atmospheric pressure pushing the ablated materials from behind. The mountain was ablated in seconds, not eroded for aeons. The product of the ablation is the apron of geo-ablative melt. It’s a much simpler model. And you don’t need to explain away the problem of a few million years worth of missing alluvium. Or the missing vent, and magma chamber. This reminds me of some puzzling fire destruction at the Estonian Kaali crater field – there’s some evidence of a wide ranging forest fire at the time of the impact (this depends on the age estimate of the craters!). It would seem that even without a single main air burst, the fireball(s) of the cluster will move to the ground and and the hot gasses/plasma will spread out like a base surge, even before the craters (of the solid fragments) are formed. 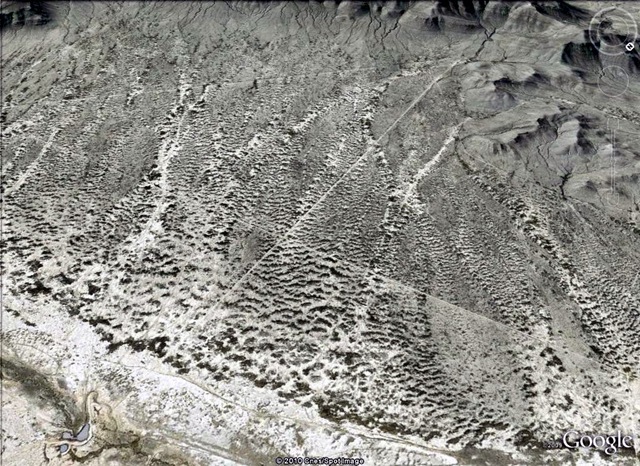 Perhaps in the case of a low airburst, this base surge can create a crater? Nice work. Were you able to confirm in the field that the rebound topographic relief displayed any surface melting or fusion of the exposed sedimentary facies since they were ablated and not eroded by water? Or would you not expect that? I was thinking of Libyan glass.